The minute I saw this chili I knew I was making it. I found it while browsing online for “smoky” chili recipes, and while I did not make the exact recipe I found (because it required a handheld smoking gun as only a Williams Sonoma recipe would! 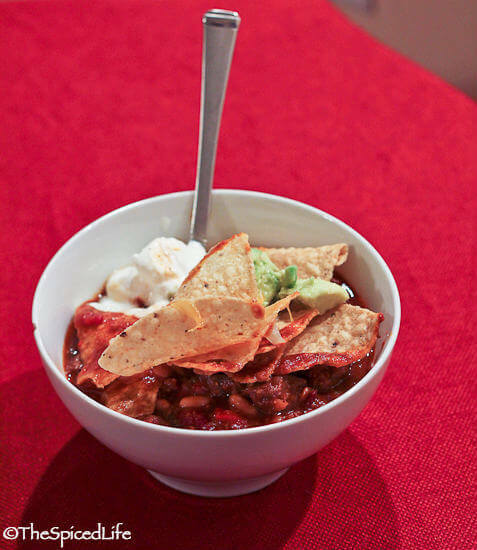 ), I was blown away by the delicious simple genius of piling tortilla chips and cheese on top of my chili. Nachos on chili. Yum. I’ll let you admire that for a moment (and truly I wish I had managed to get the chili done before I lost the light because it was a thing of beauty–my kids took one look at it and practically squealed in excitement!). 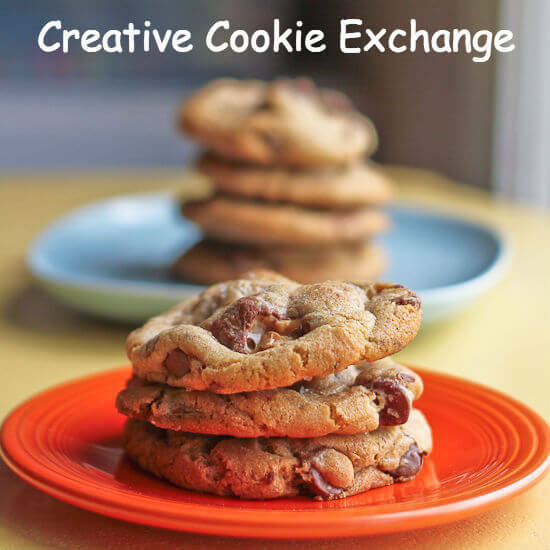 Now imagine presenting that at a Super Bowl party! Or any party for that matter. 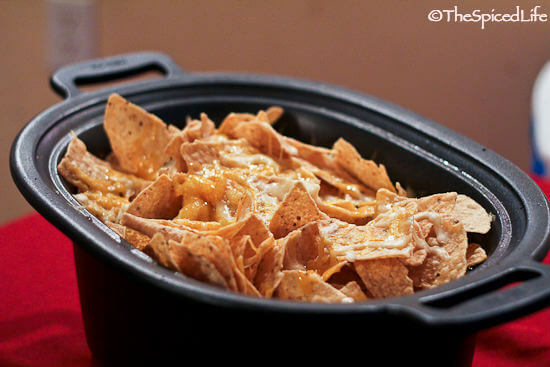 I am a total nachos addict, so to me that just looks like the most brilliant idea ever. And I am happy to say that it was. I imagine it would work on any chili for that matter, although this one was certainly delicious. Now for the fine print: Williams Sonoma said to put the slow cooker stovetop-safe insert under the broiler for the nachos. Because my slow cooker is a Williams Sonoma exclusive, I decided to trust them even though it made me nervous. So I am not promising anything about every single stovetop-safe slow cooker insert on the market, but I can tell you the cast aluminum insert made by All Clad was fine under the broiler, about 6-8 inches down, on high, for the few minutes it took to melt the cheese. 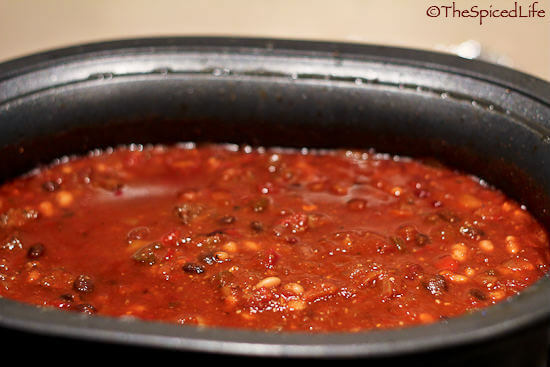 About the chili itself: this one was slightly out of my wheelhouse, as it is a chili with small chunks of brisket (or you can use chuck) braised into the chili–previously mine have always been either vegetarian or ground meat based. As I mentioned, the recipe required a smoker, so instead I focused on bacon fat, smoked salts and smoked dried chile peppers. I also increased the vegetables and beans and decreased the meat, not just for health but also because I really love beans in my chili. I am afraid I would be lost in Texas! The idea of chili without beans to me is just heresy. This chili in fact had 4 different kinds (you don’t have to use 4 different kinds though): black (canned); kidney (canned); white tepary (homecooked and frozen); and rio zape–I think (home-cooked and frozen). Season the beef generously with salt. Heat 1 tablespoon of the bacon fat over the stovetop-safe insert of a slow cooker over medium-high heat. Add half of the beef and brown it on all sides, 6 to 8 minutes per batch. Transfer to a large bowl. Add another tablespoon of bacon fat and repeat with the second half of the beef. Remove the beef and add the remaining 1-2 tablespoons of bacon fat. Add the onions with a pinch of smoked salt and cook until it is starting to caramelize, about 8 minutes. Add the carrots, celery and bell peppers with another pinch of salt and cook for another 5-8 minutes, stirring occasionally to prevent scotching or sticking. Add the garlic and cook, stirring frequently, for 1 minute. Add the chili powders, cumin, oregano and coriander and cook, stirring constantly, for 1 minute. Add the beef, broth and tomatoes, and add smoked salt and black pepper to taste, keeping in mind to add less salt, like a pinch or two, if you are using salted tomatoes and/or broth. Place the insert on the slow-cooker base, and cover and cook on high until the meat is tender, about 5 hours; during the last 30 minutes of cooking, stir in all of the beans and cornmeal. Taste the chili for additional smoked salt or black pepper. Place the rack in the lower third of your oven. 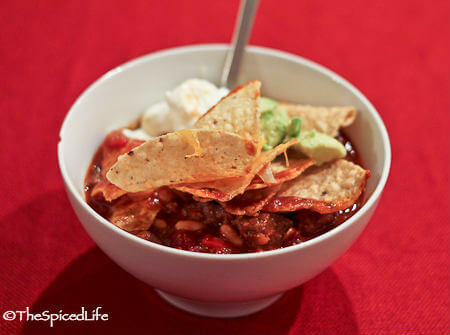 Top the chili evenly with the tortilla chips and sprinkle with half of each kind of cheese. Place the insert in the oven and turn on the broiler, on high. Broil until the cheese is melted, about 4 minutes. Serve with the remaining cheese, guacamole and sour cream for garnishes. Okay this nachos on top business is genius!! I would just like to know how I have not thought of this in my entire 26 years of life! Hey I got a lot more years on me than you do and it never occurred to me either lol! And I agree it is genius! OMG this looks amazing. I’m with your kids. And your photo looks just fine! Not counting the chips on top maybe 5? We definitely had it for 2 nights at least and there are 4 of us. Obviously you could cut the recipe in half and just use 2 kinds of beans. It also depends on the size of your slow cooker–I don’t think you would want the nachos on top to be too far down, and I have the 7 qt slow cooker.